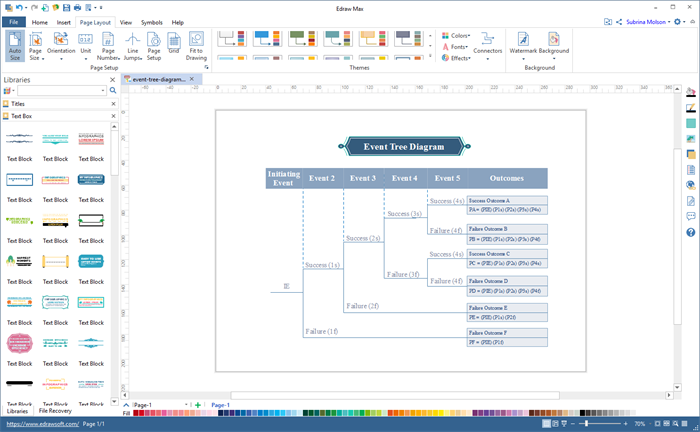 Event tree analysis is applicable to risk assessment and safety system engineering. It is used to determining the success paths and providing solutions to avoid dangers and accidents. Originating from decision tree analysis, event tree analysis becomes an accident-cognition method of deducing possibilities and outcomes in a chronological order. 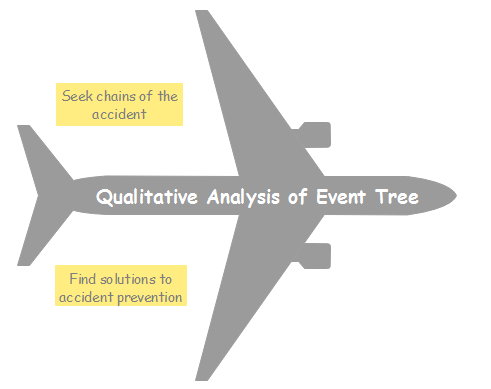 This approach uses a tree diagram called "event tree" to describe the logical relationship between probable accidents and potential reasons. Through the qualitative and quantitative analysis of the event tree, users can find the main reasons of accidents and provide reliable solutions so as to reach the purpose of speculating and preventing accidents. Qualitative analysis process occurs along with designing process. 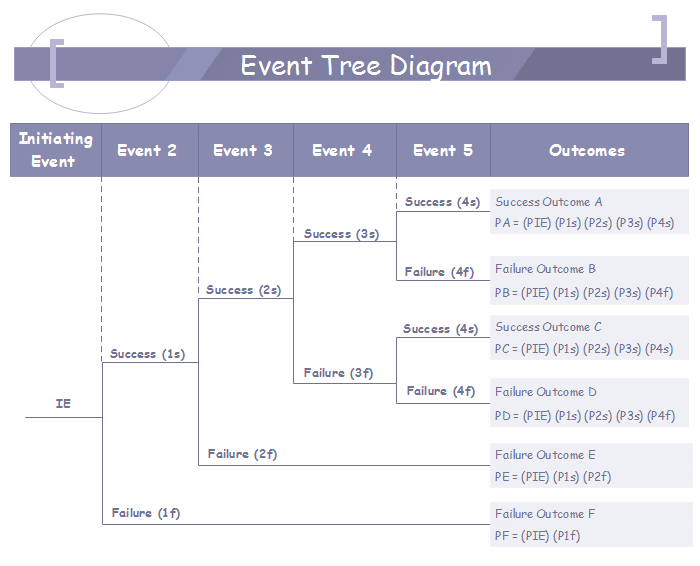 For this reason, before drawing the event tree, you should analyze the possibility of each process and probable status of each path in accordance with characteristics and objectives of the event. After designing the event tree, you need to find types of an accident occurring path and solutions to accident prevention. Commonly, there are many paths leading to system accident which makes chains of the accident. The more the successful chains are, the safer the system will be. On the contrary, fewer chains will cause the danger to the system. In order to avoid accidents, you should guarantee that all success chains are found. In order to avoid accidents, you should guarantee all success chains have solutions echoing to prevent the accidents. Final path to success instructs us to take measures of the accident prevention. 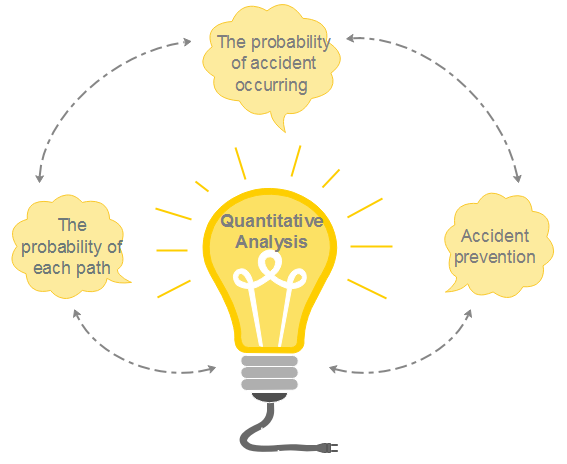 Quantitative analysis of event tree, based on the occurrence of an event, determines the accident occurring path by calculating each path of occurrence probability, comparing values of probabilities and sequencing through the possibility of an accident. Basic terms are shown as follow. The probability of each path equals products of an event occurring probabilities since initial event. The probability of accident occurring equals the sum of the probabilities of each path. Sometimes it could not be calculated because of complex conditions. With clear and logical descriptions of analyzing accident forming processes, event tree offers a strong basis for accident prevention. The analysis of the event tree provides a clear basis for the development of the incident, and it provides a strong basis for the design of the accident prevention plan and the development of the accident prevention measures. According to event tree analysis, the final accident is the result of a set of hazards. If ending the development process in time, the accidents might be avoided. Thus, in each stage of accident occurrence, steps should be taken to control the possibility, thus decreasing the occurrence probability and lead to a safe development path. Now you may have a better understanding of the event tree analysis. Try drawing with Edraw diagramming software, you may find it easy to use without drawing skills required.